8.5.3. Do I Need to Invoke the Server Every Time I Want to Introspect an RPT? Red Hat Single Sign-On is based on a set of administrative UIs and a RESTful API, and provides the necessary means to create permissions for your protected resources and scopes, associate those permissions with authorization policies, and enforce authorization decisions in your applications and services. Resource servers (applications or services serving protected resources) usually rely on some kind of information to decide if access should be granted to a protected resource. For RESTful-based resource servers, that information is usually obtained from a security token, usually sent as a bearer token on every request to the server. For web applications that rely on a session to authenticate users, that information is usually stored in a user’s session and retrieved from there for each request. It is not the most flexible access control mechanism. Roles do not represent who you are and lack contextual information. If you have been granted a role, you have at least some access. The infrastructure to help avoid code replication across projects (and redeploys) and quickly adapt to changes in your security requirements. Provides a set of UIs based on the Red Hat Single Sign-On Administration Console to manage resource servers, resources, scopes, permissions, and policies. Part of this is also accomplished remotely through the use of the Protection API. Provides a distributable policy decision point to where authorization requests are sent and policies are evaluated accordingly with the permissions being requested. For more information, see Obtaining Permissions. Provides implementations for different environments to actually enforce authorization decisions at the resource server side. Red Hat Single Sign-On provides some built-in Policy Enforcers. Being based on Red Hat Single Sign-On Authentication Server, you can obtain attributes from identities and runtime environment during the evaluation of authorization policies. Resource Management involves all the necessary steps to define what is being protected. First, you need to specify Red Hat Single Sign-On what are you looking to protect, which usually represents a web application or a set of one or more services. For more information on resource servers see Terminology. Resource servers are managed using the Red Hat Single Sign-On Administration Console. There you can enable any registered client application as a resource server and start managing the resources and scopes you want to protect. A resource can be a web page, a RESTFul resource, a file in your file system, an EJB, and so on. They can represent a group of resources (just like a Class in Java) or they can represent a single and specific resource. For instance, you might have a Bank Account resource that represents all banking accounts and use it to define the authorization policies that are common to all banking accounts. However, you might want to define specific policies for Alice Account (a resource instance that belongs to a customer), where only the owner is allowed to access some information or perform an operation. Resources can be managed using the Red Hat Single Sign-On Administration Console or the Protection API. In the latter case, resource servers are able to manage their resources remotely. 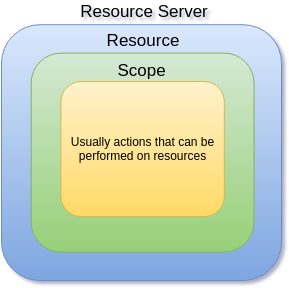 Scopes usually represent the actions that can be performed on a resource, but they are not limited to that. You can also use scopes to represent one or more attributes within a resource. Once you have defined your resource server and all the resources you want to protect, you must set up permissions and policies. This process involves all the necessary steps to actually define the security and access requirements that govern your resources. Policies define the conditions that must be satisfied to access or perform operations on something (resource or scope), but they are not tied to what they are protecting. They are generic and can be reused to build permissions or even more complex policies. For instance,to allow access to a group of resources only for users granted with a role "User Premium", you can use RBAC (Role-based Access Control). Once you have your policies defined, you can start defining your permissions. Permissions are coupled with the resource they are protecting. Here you specify what you want to protect (resource or scope) and the policies that must be satisfied to grant or deny permission. Policy Enforcement involves the necessary steps to actually enforce authorization decisions to a resource server. This is achieved by enabling a Policy Enforcement Point or PEP at the resource server that is capable of communicating with the authorization server, ask for authorization data and control access to protected resources based on the decisions and permissions returned by the server. Red Hat Single Sign-On provides some built-in Policy Enforcers implementations that you can use to protect your applications depending on the platform they are running on. Each of these services provides a specific API covering the different steps involved in the authorization process. OAuth2 clients (such as front end applications) can obtain access tokens from the server using the token endpoint and use these same tokens to access resources protected by a resource server (such as back end services). In the same way, Red Hat Single Sign-On Authorization Services provide extensions to OAuth2 to allow access tokens to be issued based on the processing of all policies associated with the resource(s) or scope(s) being requested. This means that resource servers can enforce access to their protected resources based on the permissions granted by the server and held by an access token. In Red Hat Single Sign-On Authorization Services the access token with permissions is called a Requesting Party Token or RPT for short. For more information, see Obtaining Permissions. The Protection API is a set of UMA-compliant endpoint-providing operations for resource servers to help them manage their resources, scopes, permissions, and policies associated with them. Only resource servers are allowed to access this API, which also requires a uma_protection scope. By default, Remote Resource Management is enabled. You can change that using the Red Hat Single Sign-On Administration Console and only allow resource management through the console. When using the UMA protocol, the issuance of Permission Tickets by the Protection API is an important part of the whole authorization process. As described in a subsequent section, they represent the permissions being requested by the client and that are sent to the server to obtain a final token with all permissions granted during the evaluation of the permissions and policies associated with the resources and scopes being requested. For more information, see Protection API. Before going further, it is important to understand these terms and concepts introduced by Red Hat Single Sign-On Authorization Services. Per OAuth2 terminology, a resource server is the server hosting the protected resources and capable of accepting and responding to protected resource requests. Resource servers usually rely on some kind of information to decide whether access to a protected resource should be granted. For RESTful-based resource servers, that information is usually carried in a security token, typically sent as a bearer token along with every request to the server. Web applications that rely on a session to authenticate users usually store that information in the user’s session and retrieve it from there for each request. In Red Hat Single Sign-On, any confidential client application can act as a resource server. This client’s resources and their respective scopes are protected and governed by a set of authorization policies. A resource is part of the assets of an application and the organization. It can be a set of one or more endpoints, a classic web resource such as an HTML page, and so on. In authorization policy terminology, a resource is the object being protected. Every resource has a unique identifier that can represent a single resource or a set of resources. For instance, you can manage a Banking Account Resource that represents and defines a set of authorization policies for all banking accounts. But you can also have a different resource named Alice’s Banking Account, which represents a single resource owned by a single customer, which can have its own set of authorization policies. A resource’s scope is a bounded extent of access that is possible to perform on a resource. In authorization policy terminology, a scope is one of the potentially many verbs that can logically apply to a resource. It usually indicates what can be done with a given resource. Example of scopes are view, edit, delete, and so on. However, scope can also be related to specific information provided by a resource. In this case, you can have a project resource and a cost scope, where the cost scope is used to define specific policies and permissions for users to access a project’s cost. A permission associates the object being protected with the policies that must be evaluated to determine whether access is granted. X represents one or more users, roles, or groups, or a combination of them. You can also use claims and context here. Y represents an action to be performed, for example, write, view, and so on. Z represents a protected resource, for example, "/accounts". Make changes at runtime; applications are only concerned about the resources and scopes being protected and not how they are protected. A policy defines the conditions that must be satisfied to grant access to an object. Unlike permissions, you do not specify the object being protected but rather the conditions that must be satisfied for access to a given object (for example, resource, scope, or both). Policies are strongly related to the different access control mechanisms (ACMs) that you can use to protect your resources. With policies, you can implement strategies for attribute-based access control (ABAC), role-based access control (RBAC), context-based access control, or any combination of these. Red Hat Single Sign-On leverages the concept of policies and how you define them by providing the concept of aggregated policies, where you can build a "policy of policies" and still control the behavior of the evaluation. Instead of writing one large policy with all the conditions that must be satisfied for access to a given resource, the policies implementation in Red Hat Single Sign-On Authorization Services follows the divide-and-conquer technique. That is, you can create individual policies, then reuse them with different permissions and build more complex policies by combining individual policies. Policy providers are implementations of specific policy types. Red Hat Single Sign-On provides built-in policies, backed by their corresponding policy providers, and you can create your own policy types to support your specific requirements. Red Hat Single Sign-On provides a SPI (Service Provider Interface) that you can use to plug in your own policy provider implementations. A permission ticket is a special type of token defined by the User-Managed Access (UMA) specification that provides an opaque structure whose form is determined by the authorization server. This structure represents the resources and/or scopes being requested by a client, the access context, as well as the policies that must be applied to a request for authorization data (requesting party token [RPT]). In UMA, permission tickets are crucial to support person-to-person sharing and also person-to-organization sharing. Using permission tickets for authorization workflows enables a range of scenarios from simple to complex, where resource owners and resource servers have complete control over their resources based on fine-grained policies that govern the access to these resources. In the UMA workflow, permission tickets are issued by the authorization server to a resource server, which returns the permission ticket to the client trying to access a protected resource. Once the client receives the ticket, it can make a request for an RPT (a final token holding authorization data) by sending the ticket back to the authorization server. For more information on permission tickets, see User-Managed Access and the UMA specification.